Bartonellosis is a group of emerging infectious diseases caused by bacteria belonging to the Bartonella genus. Bartonella includes at least 22 named species of bacteria that are mainly transmitted by carriers (vectors), including fleas, lice, or sandflies. 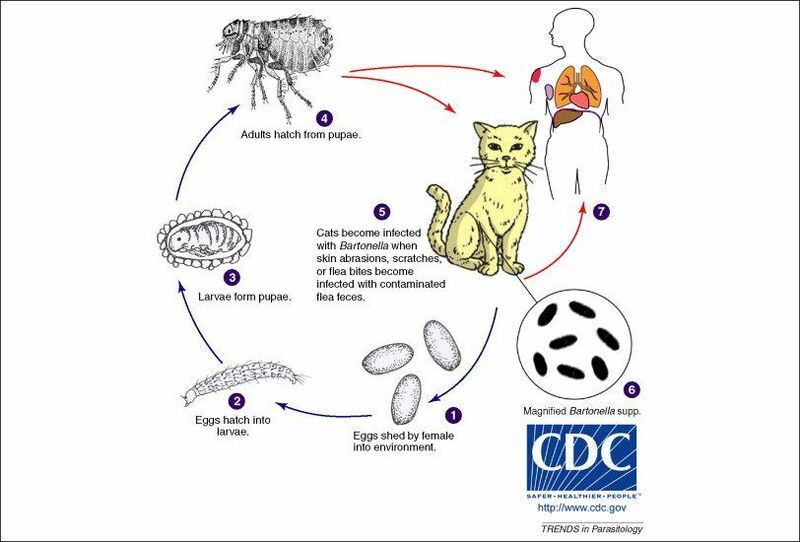 Both domestic and wild animals can be infected with Bartonella species by these vectors and spead the disease typically through a bite or scratch. Human diseases that have been identified to be caused by one of the Bartonella bacteria include; cat scratch fever (Bartonella henselae), Carrion’s disease (Bartonella bacilliformis), and trench fever (Bartonella quintana). Symptoms of a Bartonella infection include; fever, fatigue, malaise, swollen lymph nodes, joint aches and swelling, neurological abnormalities, and skin rash or markings. Bartonella has also been associated with diseases of the skin (bacillary angiomatosis), liver (peliosis hepatis), heart (endocarditis), eyes (neuroretinis), blood (bacteremia), and brain (encephalopathy). Being infected does not always result in manifestation of illness. A number of studies have detected clinically healthy people that have tested positive (seropositive) for Bartonella and those who become ill, usually develop mild disease that tends to end without treatment (self-limiting). Immunocompromised patients, such as those undergoing immunosuppressive treatments for cancer, organ transplant patients, and people with HIV/AIDS, are more likely to develop severe, life-threatening disease symptoms.